According to Hopper's projections, Americans overall are spending 6% more on Christmas air travel this year than last, with the total amount spent over the holiday period forecast at $1.8 billion in 2018 compared to $1.7 billion in 2017. Average flight prices for international trips from US origins for holiday dates are $1,133 round-trip (up 6% from $1,067 in 2017). Overall, Americans are spending 6% more on Christmas travel this year than last, with the total amount spent over the holiday period forecast at $1.8B in 2018 compared to $1.7B in 2017. The number of trips planned increased by almost 7% compared to 2017, with an estimated 30.3 million holiday travelers this year compared to about 27.5 million in 2017. How Much Are Americans Spending on Holiday Flights? 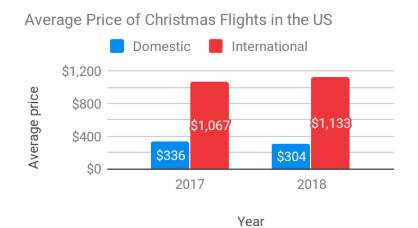 According to Hopper's projections, Americans overall are spending 6% more on Christmas air travel this year than last, with the total amount spent over the holiday period forecast at $1.8 billion in 2018 compared to $1.7 billion in 2017. The total number of trips planned also increased by almost 7% compared to 2017, with an estimated 30.3 million holiday travelers hitting the skies this year compared to about 27.5 million in 2017. While the number of trips is relatively stable, the average price for international trips from US origins has increased and the average price for domestic trips has dropped slightly compared to last year. On average, an international plane ticket could set you back by just over $1,067 during the 2017 holiday period whereas this year the price has increased to $1,133. This in part explains why sales have seen limited growth this year. The combined effect of stable sales and shifting prices leads us to conclude that the total amount spent by Americans to fly to their holiday plans will increase by close to 6% to about $1.8 billion in 2018 compared to the $1.7 billion in 2017. Which Airports Will Be Busiest This Holiday Season? In December 2017, the number of daily passengers during the holidays crossed the 3 million threshold for the first time. 2018 is beating that record almost every other day! Airports are going to be particularly busy on the 20th and the 21st with just below 3.3 million daily passengers. If you have not purchased your tickets yet, and wish to avoid lines as much as possible, you should probably aim for a departure on Saturday, December 15th or on Tuesday, December 18th as there are somewhat fewer passengers scheduled to fly on those dates. Looking at airports with the most passengers scheduled to fly during the holidays (December, 16th to December 30th) we see that the number of expected passengers has increased for each of these. Among these Chicago, Denver and Orlando will see more than 10% increase compared to last year. This information about prices going up compared to last year might seem unfortunate for those that wished to travel internationally over the holidays. However, some destinations did not follow the general trend. We've selected a few here to highlight the changes compared to last year. In September 2017 the island of Saint Martin was hit particularly hard by Hurricane Irma, a category 5 hurricane, leaving the French and Dutch island devastated. Due to this many flights to Saint Martin were no longer operating, and prices to fly to this caribbean destination skyrocketed with an average price of over $6,000 for a round trip from the US during the Christmas period. The rebuilding efforts throughout 2018 allowed the island to welcome tourists again, and the average price for a christmas holiday in Saint Martin has fallen to around $1,250 and the destination seems to have retained its popularity. While holidays on the beach sound wonderful to most people, some prefer the idea of spending Christmas under a blanket by the fireside with a cup of warm cocoa watching the snowflakes fall. For these Christmas might have been just a little bit sweeter still, since prices to fly to Canada from the US for the holidays have dropped on average by 23% from $378 to $290! Delivery times annoy you? Maybe you were among those that tried to get as close to the jolly man in red this year by vacationing in Iceland. We can't know for sure if he will actually get to their christmas tree first, but it does seem that they had a great deal on their flight, with prices from the US to Iceland having gone from $734 in 2017 to $579 in 2018 (-21%). Have you planned a trip to Egypt to celebrate the holidays? Well it would seem you aren't the only one. Egypt is a popular destination this year, and demand for round-trip flights was up 264% in 2018 compared to 2017! Does Santa Drive on the Left? Finally, it would seem that many Americans have decided to look to the United Kingdom this year to spend Christmas. Demand for flights to the island has increased by 125% compared to last year, and with the average price dropping from $905 to $824 it looks like this was also a good year to do so! 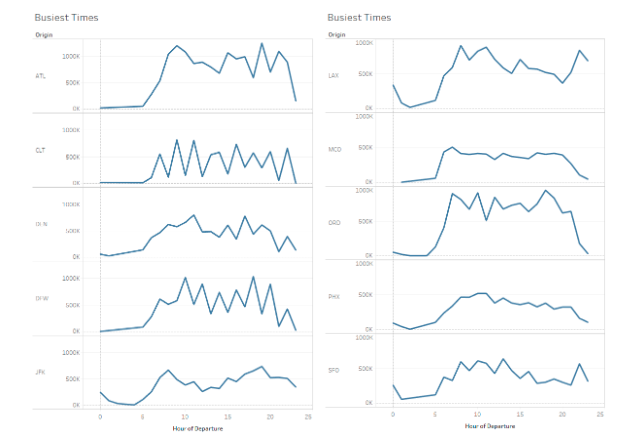 The data utilized for this study comes from Hopper's real-time "shadow traffic" containing the results of consumer airfare searches. Hopper collects, from several Global Distribution System partners, twenty to thirty billion airfare price quotes every day from searches happening all across the web. Total tickets sold were estimated as follows: change in total demand for December 2017 vs 2018 applied to the number of tickets sold in December 2017 (taking into account round trip, from the 16th to the 23rd) and correcting for only those tickets that apply to Christmas (~40% of tickets sold in December).